3 Restore my backup so that my system behaves as it did before the reinstall? Sorry if this seems terribly obvious, but I don't want to find all the problems when it's too late. Used dpkg to list packages installed. Backed up using deja dup. Also manually backed up contents of /etc to include stuff that deja dup missed. Would not boot anymore. Complained about graphics, offered basic graphics, stalled. Restored deja dup backup to /home/user but data ended up in /home/user/home/user. On closer inspection the two user directories have same inode but behave differently. Can no longer log on. Unable to write to .ICEauthority. Had to delete .ICEauthority and establish user as owner of all files in user to log in successfully. Copied contents of /home/user/home/user into /home/user. /home/user/home/user now empty. Moved /home/user/home to trash. When I try to delete /home from trash it prepares to delete what looks like the contents of /home/user. Closer inspection shows that /home/user has the same inode number as /home/user/.local/share/Trash/files/user - can I unlink and delete the unneeded trash version? Tried to reinstall software using dpkg but all packages listed as not in the database. Merde! Any way out of this? And to make matters worse, deja dup seems to have completely emptied my ~/.local/share/evolution folders of all date. I have lost all my email. Best to assume that this procedure is a non-starter and use more mundane methods a package at time. Use Deja Dup backup tool to backup on a local or cloud folder (backup-folder). To restore, just open Deja Dup after clean installation, click 'I want to restore files from previous backup...' and give backup-folder path to restore the system. Deja Dup is available in Ubuntu Store. to generate a list of all installed packages, filter for the lines that don't have an A. After installing your new system you can apply this list again in order to install all previously installed software. Have a look at the aptitude user manual on how to do that. 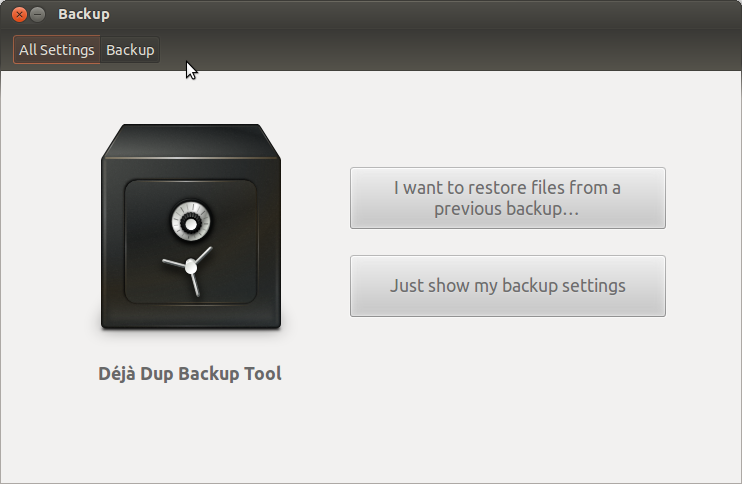 After installing the new system, you can restore the backup of your home directory and everything should be back. Note that this may not produce exactly the same results as we filtered automatically installed packages in first command. It is better not to install automatically installed packages as they will remain on the system forever. However, some dependencies are only 'recommended', and they might not get reinstalled when applying the package list. Not the answer you're looking for? Browse other questions tagged installation backup restore or ask your own question. Which folders to restore from full system backup after harddisk change? Backup /etc/ as normal user Deja Dup?